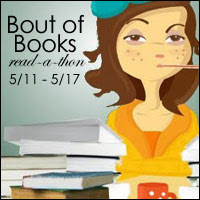 Next week, starting Monday, is Bout of Books, a week long read-a-thon organized by Amanda @ On a Book Bender and Kelly @ Reading the Paranormal. It’s a low pressure read-a-thon, where you set your own goals and take part in daily challenges and giveaways if you can, plus a couple of Twitter chats. The low pressure nature of it is what I like. This is actually the 13th “bout” but only my second – I did my first last year and really enjoyed it but the timing hasn’t been right since then. Next week is a pretty clear one for me, though, so I’m taking part again. Book wise, I haven’t picked anything yet (though having finally read Divergent, I’m thinking I might go for book 2 in the series) but am going to try stretching myself and read three books plus take part in each of the daily challenges. I’ll update on Twitter and through this post throughout the week. It should be fun and hopefully I’ll read some good books, pick up some good tips and maybe find some new book blogs. If you want to join in or find out more check out the bout of book blog here. Wish me luck! Update (11th May): Day one down and 100 pages into Insurgent. Really enjoying it. Update (13th May): I am three days in and one and a half books down. I started with Insurgent as planned (see my What I’m Reading This Week post) but then couldn’t wait to know what happened next so abandoned my plans and went straight to Allegient. Am about 100 pages in and going strong. Update (15th May): finished Allegient (didn’t see that coming!) and started on The World Before Us. Struggled a bit at first but really enjoying it now, about 20% in.